Giant salvinia (Salvinia molesta), a floating fern from southern Brazil, is currently one of the most problematic aquatic plants in Texas. It damages aquatic ecosystems by outgrowing and replacing native plants that provide food and habitat for native animals and waterfowl. Additionally, it blocks out sunlight and decreases oxygen concentrations to the detriment of fish and other aquatic animals. When plant masses die, decomposition lowers dissolved oxygen still further. Giant salvinia infestations often expand very rapidly. It can double in about a week under the right circumstances. Before it was found in Texas giant salvinia, also known as Kariba Weed, was known to cause significant problems in other areas around the world including Australia, New Guinea, New Zealand, Zambia, Zimbabwe. Giant salvinia was first identified in the Houston area in spring 1998, but later that same year it was discovered in Toledo Bend Reservoir, Texas’ largest water body. Giant salvinia may be distinguished from its smaller relative, common salvinia (Salvinia minima) another highly invasive species, by its leaf hairs. In the case of giant salvinia each of the tiny hairs on the leaf surface split four ways and then come back together at the tip to form an egg-beater shape. In the case of common salvinia the hairs do not come back together. The hairs are large enough to be viewed with a magnifying glass. Giant salvinia leaves are quarter to half-dollar sized, about twice as large as common salvinia leaves. Both plants can form dense mats on the water surface that inhibit angling, boating, and other water related recreational activities. Due to its fast growth and highly invasive nature it is illegal to transport giant salvinia on boat trailers, boat motors, or live wells. Therefore, watercraft owners are encouraged to clean boats and trailers before leaving salvinia infested water bodies. 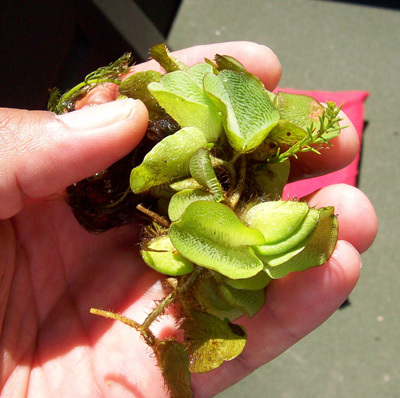 Game Wardens are authorized to issue tickets for transport of salvinia species, as well as other prohibited plants.